This is an after-actions report for the Dungeons and Dragons game I am playing, you can read the previous part here. The party is a trio formed by: Zalgius, the rogue, Arcoda, the Cleric/Ranger and Greatbeard (me), the fighter. As we have played a lot of games between this story and the previous part of my after-actions report, I will give a summary of what we did instead of an elaborate report. After the next game I will try to keep up and write a blogpost about the development of the story during that session. The map that can be seen above is the world as we know it, the grey part is terra incognita. When returning to Fallcrest we were attacked by goblins near an abandoned house. After a short battle we were able to loot the bodies of our opponents and enter the house. Inside, we found two bodies, meanwhile we opened the chest and found a shrunken head in there, and replaced it with the head of one of the bodies. A short discussion ensued about the ethics of our actions, so we decided to torch the place in order to destroy the evidence. We resumed our trip to Fallcrest and gave Trevor his chest back, which he rewarded us with some gold. When visiting the inn we heard rumours of a disaster that happened at Yimountainhill, Dwarfs were said to have died in the mines. Our sole dwarf, Zalgius, wanted us to embark on a quest to save the dwarves, which we did. On our way to Yimountainhill we found Trevor, dead, and with him an empty chest. We spent the night there as it was getting late, we divided the night in to three parts, where each of us would guard the camp. During my shift, a dwarf approached me and we talk shortly, at that time I had to awake Zalgius for his turn. He woke up only to find out that his bow that he had purchased in Fallcrest was gone, as was the dwarf. The next day we resumed our journey to Yimountainhill. Once we arrived in the almost-empty city, we hastened ourselves to meet the mayor, Ulrig ‘Lord Crewe’. In the city hall, Zalgius found his bow in a display case featuring other ‘honestly found’ items. After confronting the mayor with this fact, he promptly returned the weapon. Ulrig requested that we visit the mines in order to save dwarfs that were trapped there, in return we were allowed to take all the gold that we could carry. It turned out that there were no gold nuggets, just gold ore, so the value-weight ratio was not as we had expected it to be. While freeing the dwarfs (and fighting cave monsters) we discovered something peculiar: some dwarfs had their hearts magically removed! 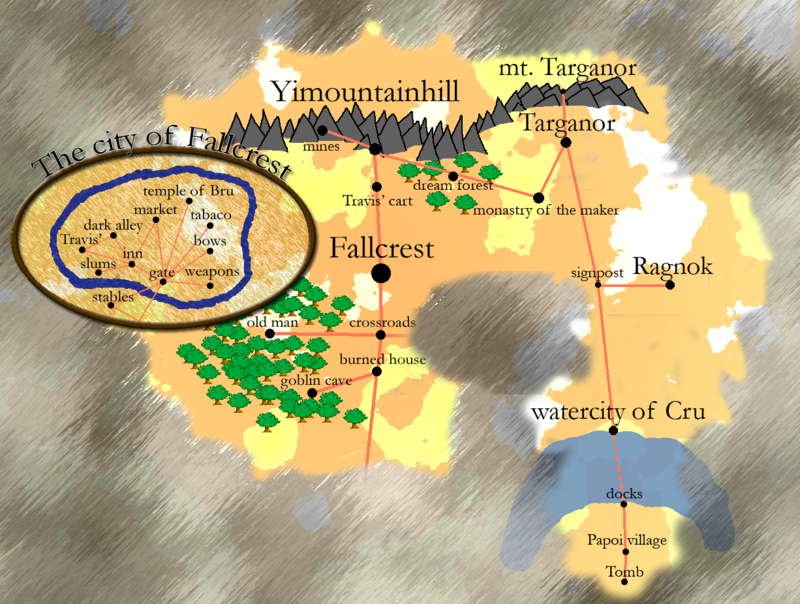 We returned to Ulrig, who was acting strangely, saying we should visit a city to the east of here, Targanor, because a lot of relatives of deceased dwarfs went there. So we ventured eastward, we were travelling at an accelerated pace until we found a small bottle on the road. Zalgius quickly opened the bottle, smelled the contents, after which we were all magically transported into a domain governed by a bunny. This is something our Dungeon Master really wanted to do. The animal wanted us to fetch a mushroom with a star on it from an elephant who lived nearby in a three-story house. When visiting the elephant, Zalgius the rogue tried to sneak in and find the item we were looking for. In an unclear sequence of events, both Arcoda and I stumbled inside the house and awakened the large creature. After being chased around for a while, we were able to grab the mushroom and leave the place. The rabbit was happy when he was given his mushroom, and shortly after handing it to him we were back in the normal world. Was it real what had just occurred before our eyes? Who knows, whatever it was, we found a mushroom with a star on the ground, which Arcoda and I split, both keeping a half in our inventory. A bit dazzled by what had happened, we arrived at the monastery of the maker, which was south of Targanor. We spoke to one of the monks there, who led us to a ghost. The spirit requested that we helped dwarves in the city of Targanor, which were getting ill for inexplicable reasons. Like the good guys we are, we accepted this quest and ventured north to Targanor. Once we got there, we found that there were almost no dwarves in the city left. Our research lead us to the local inn, where special dwarven stout was served, we suspected the inn-keeper from poisoning the dwarves. We tried talking to the city counsel (who had sacked all dwarves from their little club), they recommended us to visit mt. Targanor. When questioning several inhabitants we discovered that strange sounds had been heard coming from the mountain at night, so we decided to investigate. Upon arriving on the mountain, we tried to sneak in to an encampment that was located at the summit however, sneaking with heavy armour is not a very smart idea. When the campers discovered our presence they attacked us. When the fighting had stopped, we found an entrance to an underground lair, which we entered. Inside a group of wizards were keeping dwarves in cages hostage, we tried to devise a good plan of attack but were discovered before we could strike. In the battle that followed, we noticed that one of the wizards, who was bald, was hurt when his companions were attacked. When we struck him down, he yelled something about his love for his master Marolef. We were unsurprised to hear that the goblin-lair guy was behind the kidnapping of dwarves, apparently they were sold as slaves further down to the south in the watercity of Cru. We returned to the inn in Targanor, which seemed as empty as Yimountainhill. We pretended to rent a room and sleep, when Zalgius went to the cellar to destroy the dwarven stout (and all other beer) that made the dwarves ill. A great wave of beer flooded the inn, filling it to the ceiling with foam. Meanwhile, we made a run for it, outside the city gates we met Zalgius. At this time we decided to focus our energy on rescuing the dwarves (which pleased our dwarf party-member Zalgius) so we headed south. Of course, we collected our reward at the monastery first, which was a bit of gold and three Sending Stones. After travelling for a day we came across a signpost, that pointed to a city lying tot the east, Ragnok, which we decided to pay a visit. When entering the city, we were captured and charged with stealing an amulet from Ulrig, the mayor of Targanor. As we had experience with his way of obtaining items (the bow that was stolen from Zalgius), Arcoda and I were able to talk our way out of it. (Un)fortunately, we had to leave Zalgius behind as collateral. On top of that, he was actually accused of stealing, not us. We had one day to prove our companions innocence, so we went to the inn to gather information (and drink beer). Meanwhile Zalgius was giving us a stream of abuse through the Sending Stones, claiming we were incompetent and he was going to die. We found out that there was a poor man who liked to gamble, that suddenly had a lot of money to spend. No peasant gets rich over night without committing a crime, so we decided to pay him a visit. Apparently, the man was the local undertaker, that lived at the graveyard. He was not home, so we broke into his house and found a bill-of-sale of the amulet, signed by Ulrig, which allowed us to have Zalgius released on bail. After catching up with Zalgius, we promptly returned to the house, I kicked in the door (this time the undertaker was home) and he attacked us with help of his friends. When he was all that was left of his party, he begged for mercy, which (against my will), we gave him. Apparently, he had buried the amulet somewhere in the graveyard. We were told to come back later, as to not taint the undertakers image by digging up graves during the day. Unfortunately, my companions persuaded me to return later. At night, as was expected, we were attacked by the living dead. When they were defeated we quickly dug up the amulet and returned to Ragnok where we waited for the trial of Zalgius. Ulrig himself had arrived the next morning, but when the innocence of Zalgius was proved, he fled! We chased him for a while but he escaped in the direction of Yimountainhill. Everyone Zalgius was a bit shaken by all the dwarven hate, but we managed to get him back together and head for the watercity of Cru. In my imagination it was a city build with water flowing through small streams in to the ocean. I could not have been more wrong, it was a stinking mess of scaffolds, piers and ships, of which most were deserted. We informed at the office of the harbourmaster, who told us that we should look for a man named Roi, the only man who was still sailing to the other side. A short while later, and 100 gold pieces lighter, we were sailing south toward the island of Zurka. Roi wasn’t nervous, even after telling us that a lot of ships that tried to make the crossing had disappeared. When the story was finished, the boat was sucked in to a large whirlpool. The last words I heard from Roi were ‘oh no, why are they doing this to me?’. I could see everyone around me get dragged into the deep dark waters. When I woke up, I was wet and found myself on a floor covered with purple moss, I was relieved to see that my companions were still alive. We contemplated if we were actually under water, and tried to touch the ceiling, which we couldn’t. We were able to escape the dungeon by solving various puzzles, one of which was a chamber filled with slowly rising water and a set of levers linked to specific letters. We had to pull the levers in order to spell ‘LORD’. Our Dungeon Master is a huge fan of Deep Purple, we played this part on 16 July, the day Jon Lord died. We never revealed the clue that was underneath the purple moss at the start of the dungeon, so we had solved the puzzle by trial-and-error. The next session, ‘Zalgius’ had a list with him containing all (ex)members of Deep Purple! At the end of the dungeon Lord Lord spoke to us, while playing on an organ, telling us we had to prove ourselves before we were allowed to return to the surface. The opponent was a shadow version of myself, Greatbeard, he was twice as tall and strong, a long battle ensued which ultimately we won. The next thing we know we are in the docked sailing boat of Roi. Being confused by what just happened, I asked him how he could still be alive, but he shrugged of all our questions. Instead, Roi demanded we helped him carry his goods to the village. When we arrived at the village, filled with goblins, Roi told us about how he was able to communicate with the chief, despite them not speaking common. A weird spectacle ensued, with Roi waving his arms and feet around. He then turned to us, speaking softly that we should leave the village as the tribe was preparing for a ritual. We decided to take a stroll through the woods, with Roi as our guide. Roi pointed out a toxic plant that grew everywhere and I drew a picture of it, as it might be useful to identify it later. Our guide fell down and we had to carry him back to the village, where we left him with the goblins. As the ritual was not prepared yet, we decided to travel south into the jungle, as we thought it would lead further inland because the coast was to the north.